We gave GrabGas a week to respond to the ongoing fiasco, and seeing no response we wrote our lessons learnt from the situation and signed it off. 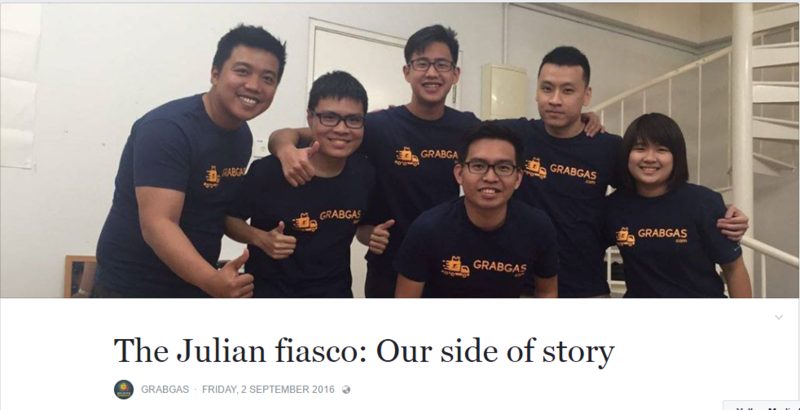 However, in a recent turn of events, GrabGas has finally published a Facebook note on their own, detailing not just the events between Julian Ee and the team but their company history and background. The post however is rather lengthy and quite hard to get through. However, since the GrabGas team has taken the time to talk about the incident and they’ve covered their roots (which I guess was meant to be the premise of why they value company culture that Julian was not a good fit for, according to them), these are some of the things that stood out to us after reading. If you’ve already read Julian’s version of how GrabGas came about, that doesn’t seem to be widely different from what GrabGas has said. There was this key bit we noticed. According to them, they did have an understanding about salary and future profit divisions, though it has to be noted that this was verbal, and this was all before Julian came on board. 2. When Julian comes into the picture, the understanding of the agreements start to differ. One of Julian’s main beefs with GrabGas was that he was invited on board as a shareholder, and he has the screenshots which appear to side his version of events. They further emphasised that they had a meeting after the offer was made where they disclosed the shares everyone had, made clear on each member’s position in the company and everyone present (Julian included) was amenable. So technically, if he did get the shares, he can be considered a shareholder. However, according to Julian, when the company was registered, he wasn’t involved, even though supposedly all shareholders are meant to be. 3. No one really seems to know where the communication breakdown began. According to GrabGas, their first indication that something was wrong was during the drafting of the company agreement with the help of corporate lawyer to the employees of GrabGas. Julian came in to discuss his shares. They did find out about his misunderstanding of the 15% of shares split to investors then (he had heard 50%), which tallies with his account. GrabGas did agree to a re-negotiation of terms with Julian after this. 4. There were misaligned expectations from the get-go. The GrabGas team expressed shock when, as they said, they found out that Julian wished to be a founder of his own company and saw GrabGas as a stepping stone for his entrepreneur journey. To the team, they saw this as a lack of loyalty to the company. 5. Emotions and mistrust started getting in the way of negotiations, then made them question him as a team member. The team was candid in their post and admitted that though they still thought of Julian as a very talented individual, they were “very troubled by some of his accusations and statement that can be described as emotionally fueled, and hurting the morale of the rest of the team”. 6. They believed that the price they had offered to him for his tech was fair. One major issue in the discussion was that GrabGas were undervaluing Julian’s tech, which he believed carried a market rate of RM40-60k. What the GrabGas team found was that there were professional companies willing to charge RM28-35k for the website and the app of the tech they were trying to replace. To them, their final offer of RM30k was a fair one. Negotiations soon broke down after. 7. They did not address issue of reporting the wrong numbers. There was no mention of the data in the lengthy Facebook note, but Sean Hoo, CEO of GrabGas did briefly mention it in his public Facebook post of the incident, which went up about ten minutes after the Facebook note. We’re not sure what it means—does it mean that they inflated the numbers to protect their investors? Why provide false data in the first place? At the end of the day, we feel Facebook user Dylan Ler, summed it up the best, in true Manglish style.